Unicorn Party Set: The Lovely unicorn cake topper(eyelashes included) can bring more fun for the party. 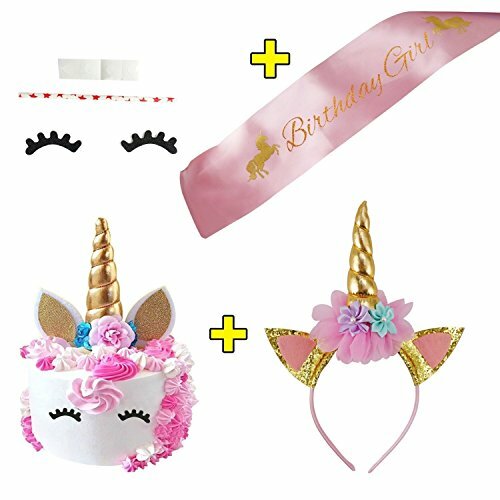 High quality headband and satin sash- Cute Cat Ears Unicorn design, make your kids more lovely and pretty. 3D Unicorn Cake Topper(eyelashes included) - 5.8" 3D Unicorn Horn will make your unicorn cake more outstanding. Perfect for an 8 to 10 inch cake to celebrate your kid's unicorn birthday. Handmade Unicorn Headband - ONE SIZE FITS ALL. The headband measures 10.6" x 8.0", the horn is 4.7" tall, Size fit from age 1 and up including adults. High quality headband with shiny golden unicorn horn wrapped with golden rope. Soft & lightweight, comfortable enough to wear all night long. Elegant Pink Satin Birthday Girl Sash - Now that your child's transformed into a magical unicorn with our beautiful gold and pink satin sash a whole new world is ready to be explored, creating priceless memories with loved ones. VERSATILE PARTY ACCESORY: Our unique unicorn happy birthday party decorations are perfect for any birthday (boys, girls, kids or adults). An easy way to make the special day more festive. If you have any questions about this product by Purrfi, contact us by completing and submitting the form below. If you are looking for a specif part number, please include it with your message.